Abstract: Aim: The aim of this study was to address several ethical aspects concerning the behavior of endodontists and general dentists regarding endodontic instrument fracture during root canal treatment. 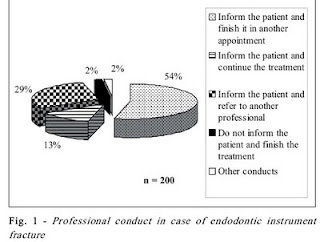 Methods: The responses of a group of professionals (endodontists and general dentists) to a questionnaire were reviewed and analyzed statistically by Fisher’s Exact and chi-square tests at 5% significance level. Results: Forty-six percent of the interviewees responded that they would try to solve the problem without informing the patient about the accident. Only 28.1% of the participants affirmed that they would let the patient know right at the moment of occurrence. 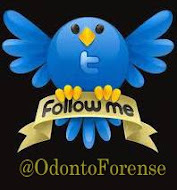 Conclusions: The outcomes of this survey demonstrate that most professionals are afraid of informing their patient about an accidental endodontic instrument breakage during treatment and might be subject to lawsuits (Publicado em: Brazilian Journal of Oral Sciences. April/June 2008.Vol 7, n. 25). Baixar texto completo (download full text). Meu paciente, meu amigo ou meu vilão?